Originally posted as 25 Years Ago This Week in 2012. Updated in 2017. It's always disappointing when you like a music act and they go and do something really awful. That's what happened this week in 1987 when the first single from a new album by Eurythmics landed on the chart. I'm often the last person to jump off an artist's bandwagon, buying their seventh and eighth albums long after everyone else has moved on to something new, but sometimes even I give up on an artist I've long enjoyed. Another case in point: MDNA. Meanwhile, it was the final week for Los Lobos as proud owners of the number 1 single in Australia. "La Bamba" spent its seventh and final week at the top. Jimmy Somerville's former band, Bronski Beat, had trouble with their covers, but the reverse was true for Communards, who flopped with another original. Good thing they had a remake up their sleeves. Best known as the original performer of "It Must Be Love", British singer Labi Siffre broke a 15-year chart drought (and his own retirement) with the release of this UK top 5 protest song. I can see why "Catch" might not have, er, caught on, but there really was no excuse for "Just Like Heaven" not restoring The Cure to the top 50. Shame, Australia. "Let's Dance" had given him the biggest hit of his career locally, but this appealing (in a MOR kind of way) follow-up took Chris Rea back outside the top 50 where he usually resided. It had everything going for it: a cover of a Bee Gees disco classic, a "secret" vocal by man of the moment George Michael... OK, that was about it. Even so, it's a little surprising this single didn't perform better in Australia. In the UK, it had been a number 7 hit for the man behind BBH, George's cousin, Andros Georgiou. George's contribution went uncredited since this track came out on a different record label - and we all know how troublesome George's own label, Epic Records, were to deal with! 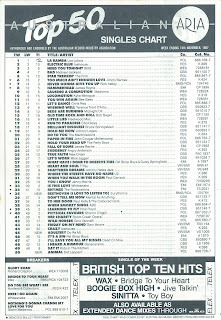 (Spoiler alert: the other two Singles Of The Week by Wax, which actually only reached number 12 in Britain, and Sinitta ended up making the top 50). Last week we had Whitesnake, this week it's fellow Brit rockers Def Leppard making an appearance with the first (or second, depending where you lived) single from the mammoth Hysteria album. Either way, "Animal" was the first song to strike a chord with the heavy metal-loving public. It would only reach number 46 in Australia (popping in and out of the top 50 over the next few weeks, and not doing any better on re-release in 1990). But, unlike other lead single "Women", it got people excited about the group's return following a long hiatus in which drummer Rick Allen recovered from the car accident that resulted in the amputation of his left arm. Better singles were to follow, including "Pour Some Sugar On Me" and "Love Bites", which had big choruses I could not ignore, but "Animal" was a nice start. I never really got Do-Re-Mi. They were a bit too quirky and Melbourne for my taste. After all, they once had a single called "King Of Moomba", named after the annual festival held in the city. Even their top 5 debut single, "Man Overboard", left me a little bit cold. Listening to this track now, I'm still not overly excited by it. I didn't have to worry about Do-Re-Mi for much longer, though, with the band splitting in 1988 and Deborah Conway going on to a briefly successful solo career (of which 1991 single "Under My Skin" was a highlight). I could not stand this song. Sorry, I just had to get that off my chest. I hated the music, the video freaked me out and I thought Eurythmics had completely lost the plot. Annie Lennox's barking mad turn in the clip only served to convince me of that. It would seem, though, that a lot of people disagreed with me since this first single from the Savage album did quite well on the Australian chart. 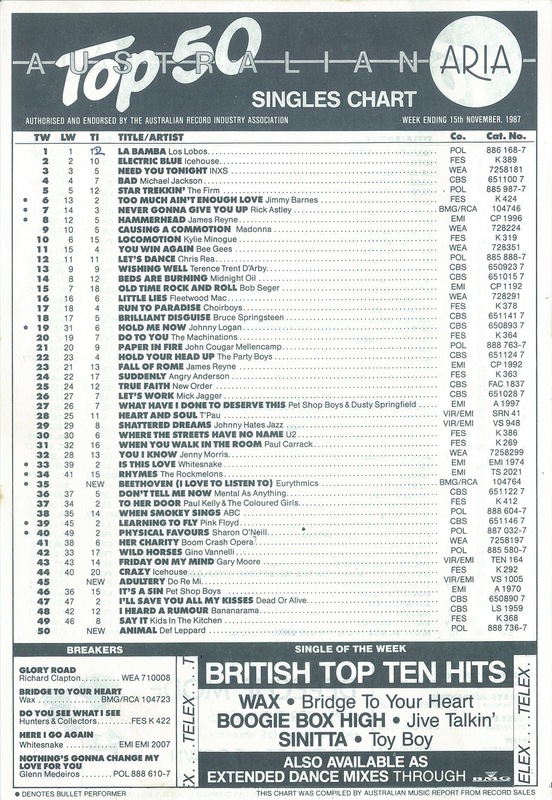 Yet, after being singles chart fixtures for the previous few years, it was all about to come down in a crashing heap for the duo, with only one more top 20 hit to come locally (1989's "Revival"). I maintain that this was the beginning of the end. Next up, I'll continue my trip through my favourites for 1988 with the top 50 still to come. Then, this time next week, seven (count 'em!) big new entries on the ARIA chart to recap. I agree Gav, "Beethoven (I Love to Listen To)" is pretty shithouse. I liked "You Have Placed A Chill..." but their 87-89 output was nowhere near as good as earlier in the decade. I didn't discover 'Beethoven' until 2002, which is odd, considering I knew all of Eurythmics' other charting single in Oz around the time they were released, and even the follow-up flops from 'Savage'. I like it, though the video probably helps, as it's not much of a 'song' (in the conventional sense) in its own right. I love the 'housewife' Annie, and when the crazy drag queen Annie trashes the house. It was quite a bold move as the first release from a new album, and a stark contrast from the radio-friendly stadium-rock of 'Revenge'. MDNA is actually a really good album, Gavin! Masterpiece, Girl Gone Wild, Love Spent, Best Friend, I'm A Sinner, Turn Up The Radio, I F*cked Up, Falling Free...all great songs! I also love Give Me All Your Luvin' (which a lot of people dislike) and Superstar is super catchy. To each their own, though :-). I agree that Eurythmics swerved a bit too far with "Beethoven" (the single edit isn't available anywhere, and I guess Annie and Dave don't rate it overly highly, either, given its omission from all of the GH collections). They'd been so consistently spectacular up to that point. I think in today's streaming environment, they would have struggled to have a hit with it, since a fan base rushing out to buy a new single was enough back then for an established act to score a hit, whereas now, you need to make sure that people actually keep listening to it (rather than just being motivated to go out and buy it). Can you imagine if the charts had been based on how many times people actually played a song back when we were teenagers? !